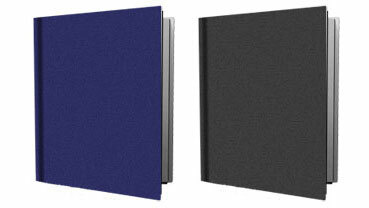 Hardcover/Casebound binding is the highest quality binding available. The 80# printed sheet is glued on heavy binder board to make a smooth outside cover. The cover can be printed in color or black and white. The book block is then attached to the inside of the board, making a very durable Hardback book cover. We only offer 5.5 x 8.5, 6 x 9 and 8 x 10.75 (three sizes). Please keep in mind that the cased hard cover order production time is longer than our standard turnaround time. Standard turnaround time is 20-25 business days, but please contact us for exact times. Note, we cannot print on cloth hardback covers. The minimum order is 25 copies and a minimum 24 pages for each copy. The maximum number of pages is 500. InstantPublisher sews all hardcover books as libraries require. This ensures that the book will last a very long time. Most other short run publishers simply glue their hardback books, resulting in premature failure. Cloth binding is also an option that InstantPublisher offers where the binder board is covered with cloth and a dust jacket is used to identify the book. The dustjacket option includes a 3-inch fold that wraps inside the book for additional printing space. The dustjacket option is also available with our standard cased option.